Curitiba (Tupi: "Araucaria angustifolia Nut Land", Brazilian Portuguese: [kuɾiˈtʃibɐ]) is the capital and largest city in the Brazilian state of Paraná. The city's population was 1,879,355 as of 2015[update], making it the eighth most populous city in Brazil and the largest in Brazil's South Region. The Curitiba Metropolitan area comprises 26 municipalities with a total population of over 3.2 million (IBGE estimate in 2010), making it the seventh most populous metropolitan area in the country. From the top, clockwise: aerial photography of the city; Paço da Liberdade in Praça Generoso Marques; Avenida Palace with the 15th of November Street; 24 Hour Street; Oscar Niemeyer Museum and Botanical Garden. The city sits on a plateau at 932 metres (3,058 ft) above sea level. 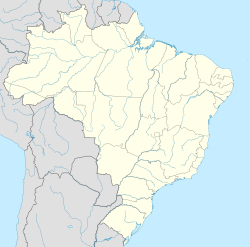 It is located 105 kilometres (65 mi) west of the seaport of Paranaguá and is served by the Afonso Pena International and Bacacheri airports. 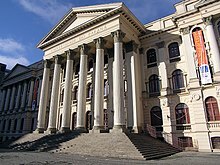 Curitiba is an important cultural, political, and economic center in Latin America and hosts the Federal University of Paraná, established in 1912. In the 1700s Curitiba's favorable location between cattle-breeding countryside and marketplaces led to a successful cattle trade and the city's first major expansion. Later, between 1850 and 1950, it grew due to logging and agricultural expansion in Paraná State (first Araucaria angustifolia logging, later mate and coffee cultivation and in the 1970s wheat, corn and soybean cultivation). In the 1850s, waves of European immigrants arrived in Curitiba, mainly Germans, Italians, Poles and Ukrainians, contributing to the city's economic and cultural development. Nowadays, only small numbers of immigrants arrive, primarily from Middle Eastern and other South American countries. Curitiba's biggest expansion occurred after the 1960s, with innovative urban planning that allowed the population to grow from some hundreds of thousands to more than a million people. Curitiba's economy is based on industry and services and is the fourth largest in Brazil. Economic growth occurred in parallel to a substantial inward flow of Brazilians from other parts of the country, as approximately half of the city's population was not born in Curitiba. Curitiba is one of the few Brazilian cities with a high Human Development Index (0.856) and in 2010 it was awarded the Global Sustainable City Award, given to cities and municipalities that excel in sustainable urban development. According to US magazine Reader's Digest, Curitiba is the best "Brazilian Big City" in which to live. Curitiba's crime rate is considered low by Brazilian standards and the city is considered one of the safest cities in Brazil for youth. The city is also regarded as the best in which to invest in Brazil. Curitiba was one of the host cities of the 1950 FIFA World Cup, and again for the 2014 FIFA World Cup. Despite its good social indicators, the city has a higher unemployment rate than other cities in the state. At the end of the 17th century, Curitiba's agriculture was only for subsistence and its main economic activities were mineral extraction. 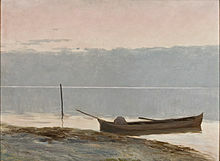 Waves of European immigrants arrived after 1850, mainly Poles, Italians, Germans (mostly from Russia) and Ukrainians. Cattlemen drove their herds from Rio Grande do Sul to the state of São Paulo, turning Curitiba into an important intermediate trading post. 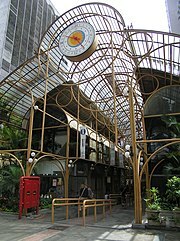 Around the beginning of the 20th century, Curitiba benefited from the wealth of the yerba mate mills. The owners (known as "barões da erva-mate") built mansions in the capital. These have mostly been preserved in the districts of Batel and Alto da Glória. In the 1940s and 1950s, Alfred Agache, co-founder of the French Society for Urban Studies, was hired to produce its first city plan. It emphasized a "star" of boulevards, with public amenities downtown, an industrial district and sanitation. It was followed in part, but the plan was too expensive to complete. Curitiba has a subtropical highland climate but always humid (Köppen: Cfb), with some characteristics of the oceanic climate due to its abundant precipitation all year round and the summer relatively warm but not hot.). What differs the city of typically temperate climates, are its mild winters due to low latitude. It is located on a plateau and the flat terrain with flooded areas contribute to its mild and damp winter, with an average minimum temperature of 7 °C (45 °F) in the coldest month, occasionally falling below 0 °C (32 °F) on the coldest nights. During summertime, the average temperature is around 25 °C (77 °F) at daytime, but it can get above 30 °C (86 °F) on the hottest days. Snowfall was experienced in 1889, 1892, 1912, 1928 (two days), 1942, 1955, 1957, 1962, 1975, 1988 and again in 2013. The catchment area of Curitiba consists of rivers and streams that cross the city in different directions, grouped in six river basins. The main rivers that form the city's watershed are: Atuba River, Belém River, Barigüi River, Passaúna River, Ribeirão dos Padilhas and the Iguaçu River, all with characteristics of dendritic drainage. Curitiba has been working since the 1970s on alternatives to minimize the negative impacts of urbanization on rivers. An example is the construction of parks along the rivers with artificial lakes, which absorb and retain water for longer periods of time, minimizing floods. After many studies of local water flows, most rivers were found to be subject to a canalization process. Other alternatives developed to minimize the negative effects of urbanization are the implementation of programs for environmental education, inspection and monitoring, elaboration and application of legislation and infrastructure works. The city covers 432.17 square kilometres (166.86 sq mi) on the First Plateau of Paraná. Curitiba has a topography of smooth, rounded hills, giving it a relatively regular shape. The city has an average altitude of 934.6 metres (3,066 ft) above sea level. The highest point is to the north at 1,021 metres (3,350 ft), and with lower altitudes at 864 metres (2,835 ft) to the south. Mountain ranges and sets of rocky hills surround parts of the city, including the Serra do Mar, a hill range between the shore of the Atlantic Ocean and the First Plateau in Paraná. As of 2017[update], the mayor is Rafael Greca, who replaced Gustavo Fruet. The City Council of Curitiba has 38 councillors elected since 2004. Curitiba is divided into nine regional governments (equivalent to subprefecture), who manage the municipality's 75 districts. The Rua da Cidadania ("Street of Citizenship") is the symbol of administrative decentralization; it is a reference point and a meeting place. Several units are annexed to public transport terminals. Their nuclei offer services in the local, state and federal areas. Time magazine listed this former mayor among the world's most influential thinkers of 2010. In the days before free direct elections, mayors were political appointees who were no more than pawns in the game of power politics and were subject to replacement at any time. For an idealistic young architect like Lerner, retaining the mayor's office was particularly precarious. Those holding the reins of power at the time were under the mistaken impression that Lerner's youth would make him easy to control. As it turned out, he was no milquetoast, and subsequently set about enthusiastically pursuing reform. According to the 2010 IBGE Census, 1,678,965 people resided in the city of Curitiba. The census revealed 1,381,938 White people (78.9%), 294,127 Pardo (Multiracial) people (16.8%), 49,978 Afro-Brazilian people (2.9%), 23,138 Asian people (1.4%), 2,693 Amerindian people (0.2%). As with most of Southern Brazil's population, Curitiba is mostly inhabited by European descendants. The first Europeans to arrive were of Portuguese origin, during the 17th century. They intermarried with the native people and with the African slaves. The Memorial of Polish Immigration was inaugurated on 13 December 1980, after the visit of Pope John Paul II in June. Its area is 46,000 square metres (500,000 sq ft) and was part of the former Candles plant. The seven wooden log houses are parts of this memorial area, as a memento of the Polish immigrants' struggles and faith. Objects like an old wagon, pipe of cabbage and a print of the Black Madonna of Częstochowa (patron saint of the Polish people), form parts of the memorial. 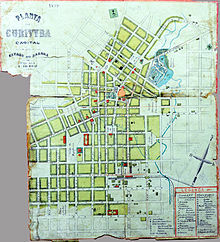 The first group of Poles arrived in Curitiba around 1871. Curitiba has the biggest colony of Polish immigrants in Brazil. Italian immigrants started arriving in Brazil in 1875 and in Curitiba in 1878, coming mainly from the Veneto and Trento regions of Northern Italy. They settled mostly in the Santa Felicidade neighborhood, still a centre of the Italian community. Curitiba is the 2nd Pole on Technological Innovation in Brazil, according to IPEA (Applied Economic Research Institute). The 2nd Brazil's Best City for Business and 5th South American Best City for Business, according to America Economia Magazine/2005 and 2006. The Best Destination for Business, according to Veja Magazine of 2007. The 3rd position among the Champions of Infrastructure, Exame Magazine of 2006. The 2nd Best City to Work in Southern Brazil, according to Você S.A. Magazine of 2005. The 49th Position, MasterCard Worldwide Centers of Commerce: Emerging Markets Index of 2008. One of the highlights according to the survey Offshoring Horizons performed by Watson Wyatt of 2007. One of the 10 global sustainability centres, according to Ethisphere Institute of 2008. Curitiba is also home to the largest cancer hospital in the South of Brazil, Erasto Gaertner Hospital. In 2007, the city placed third in a list of "15 Green Cities" in the world, according to "Grist" magazine, after Reykjavík in Iceland and Portland, Oregon in the United States. As a result, according to one survey, 99% of Curitibans are happy with their hometown. Jaime Lerner suggests urban acupuncture as the future solution for contemporary urban issues; focusing on very narrow pressure points in cities, can create positive ripple effects. Urban "acupuncture" reclaims land for the public and emphasizes the importance of community development through small interventions in design of cities. It emphasises pinpoint interventions that can be accomplished quickly to create a make an immediate impact. Estação Tubo Praça Osório, one of the tube-shaped bus stops in Curitiba. Several association football teams play in Curitiba, Coritiba plays at Estádio Major Antônio Couto Pereira, Clube Atlético Paranaense at Estádio Joaquim Américo Guimarães. Both Coritiba and Atlético Paranaense have won Campeonato Brasileiro Série A, in 1985 and 2001, respectively. Estádio Joaquim Américo Guimarães was one of the 12 stadiums to host games of the 2014 FIFA World Cup held in Brazil. The stadium Vila Capanema have hosted the 1950 FIFA World Cup which still is home to Paraná Clube. Clube Atlético Paranaense (Brazilian champion of 2001). Arena da Baixada is one of the three privately owned stadiums of the 2014 FIFA World Cup. 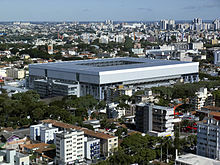 The other two are Beira-Rio stadium, in Porto Alegre and Arena Itaquera, in São Paulo. Arena da Baixada is considered one of the most modern stadiums in Brazil. This is the lowest budget of all venues of the 2014 FIFA World Cup. Most of the original stadium was preserved, and just an expansion is planned; today's capacity is 25,000, which should be increasead to about 42,000. Panorama of inner Estádio Joaquim Américo Guimarães during a game between Sociedade Esportiva Palmeiras and Clube Atlético Paranaense. ^ "IBGE releases population estimates for municipalities in 2017. Brazilian Institute of Geography and Statistics (IBGE) (August 30, 2017)". Ibge.gov.br. Retrieved 30 August 2017. ^ The European Portuguese pronunciation is [kuɾiˈtiβɐ]. ^ "Mapa da Região Metropolitana de Curitiba – Paraná". Curitiba-parana.com. Retrieved 22 July 2009. ^ "IBGE :: Instituto Brasileiro de Geografia e Estatística". 14 June 2011. Archived from the original on 14 June 2011. Retrieved 9 December 2017. ^ a b "Tradições Culturais" (in Portuguese). Curitiba-parana.net. Retrieved 7 March 2011. ^ "A imigração árabe muçulmana em Curitiba" (in Portuguese). Etni-cidade. Archived from the original on 5 December 2008. Retrieved 3 October 2008. ^ "Dados do IBGE sobre Curitiba" (in Portuguese). IBGE. Retrieved 31 July 2011. ^ "Cidades Brasileiras, Curitiba" (in Portuguese). SuaPesquisa. Retrieved 31 July 2011. ^ "Quase metade de Curitiba é dos "estrangeiros"" (in Portuguese). Bem Paraná. Retrieved 6 August 2008. ^ "The Brazilian city Curitiba awarded the Globe Sustainable City Award 2010". globeforum.com. Archived from the original on 14 July 2014. Retrieved 7 July 2014. ^ "Brazil Outsourcing: Curitiba Comes On Strong as 'Silicon Valley South'". Nearshore Americas. Retrieved 3 January 2013. ^ "Bestcitiestolivein.net". Bestcitiestolivein.net. Archived from the original on 23 July 2012. Retrieved 3 January 2013. ^ "As 10 capitais mais seguras para os jovens do Brasil". Planetasustentavel.abril.com.br. Retrieved 22 March 2017. ^ "Curitiba é eleita a melhor cidade do Brasil pelo ranking Istoé/Austin Ratings - ISTOÉ DINHEIRO". Istoedinheiro.com.br. 18 September 2015. Retrieved 9 December 2017. ^ "Curitiba name origin". Inf.ufpr.br. 20 October 2004. Retrieved 7 March 2011. ^ a b c d e f "History of the City". Curitiba. Retrieved 24 May 2018. ^ "Palacetes suntuosos do início do século foram inspirados em referências trazidas pelos ervateiros de suas viagens à Europa". Gazeta do Povo (in Portuguese). grp.com. 3 November 2015. Retrieved 21 May 2018. ^ "Curitiba, Parana Travel Weather Averages (Weatherbase)". Weatherbase. Retrieved 31 January 2019. ^ "Plano Diretor de Drenagem Urbana de Curitiba. Volume II - Volume Técnico. : Tomo 2 - Politicas e Ações Não Estruturais" (PDF). City Hall of Curitiba. 2012. ^ "Plano Diretor de Drenagem Urbana de Curitiba. Volume II - Volume Técnico; Tomo 4: Caracterizações e Medidas de Controle Estruturais" (PDF). City Hall of Curitiba. 2012. ^ "SYNOP: SUMMARIZED DATA FOR CURITIBA". Mundomanz. Retrieved 25 July 2013. ^ "METAR: Weather History for Curitiba, Brazil". Weather Underground. Retrieved 25 July 2013. ^ "Frente fria traz chuva ao Paraná e aumenta taxas de umidade" (in Portuguese). Bemparana.com.br. Retrieved 7 March 2011. 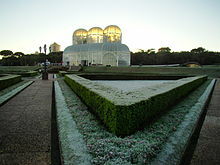 ^ "Winter of Curitiba is dry and cold". Portal.rpc.com.br. Archived from the original on 31 July 2012. Retrieved 7 March 2011. ^ "Normais Climatológicas Do Brasil 1981–2010" (in Portuguese). Instituto Nacional de Meteorologia. Retrieved 14 October 2018. ^ "Banco de Dados Meteorológicos para Ensino e Pesquisa" (in Portuguese). INMET. Retrieved 14 October 2018. ^ "Station Curitiba" (in French). Meteo Climat. Retrieved 14 October 2018. ^ "Curitiba (83842) - WMO Weather Station". NOAA. Retrieved 27 December 2018. Archived December 27, 2018, at the Wayback Machine. ^ "Livro mostra roteiros das árvores de Curitiba/Pr" (in Portuguese). Ambiente Brasil. Archived from the original on 19 October 2015. Retrieved 25 May 2005. 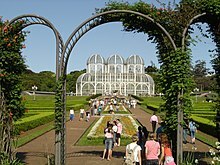 ^ "Curitiba, Brazil Travel Guide - Government - Zoohara". Zoohara.com. Retrieved 22 March 2017. ^ "Sitemap - ダポキセチンで早漏改善！". Citiesforpeople.net. Archived from the original on 12 March 2016. Retrieved 22 March 2017. ^ "Former Curitiba Mayor Jaime Lerner". English.cw.com.tw. Retrieved 9 December 2017. ^ "Maiores cidades do Brasil crescem menos do que média nacional, aponta Censo - Notícias - Cotidiano". Noticias.uol.com.br. Retrieved 22 March 2017. ^ "Internet Archive Wayback Machine". Web.archive.org. 3 July 2007. Archived from the original on 3 July 2007. Retrieved 16 September 2011. ^ "The 'Curitibano". Prefeitura de Curitiba. Retrieved 19 March 2013. ^ "Polish Memorial of Curitiba". Parques-curitiba.com. Archived from the original on 15 July 2011. Retrieved 7 March 2011. ^ "Imigração e Cultura Italiana" (in Portuguese). Curitiba-parana.net. Retrieved 7 March 2011. ^ "Ukrainian memorial in the city of Curitiba". Curitiba-parana.net. Retrieved 7 March 2011. ^ "Paraná Government (Ukrainian community in the State)". .pr.gov.br. Archived from the original on 12 July 2010. Retrieved 7 March 2011. 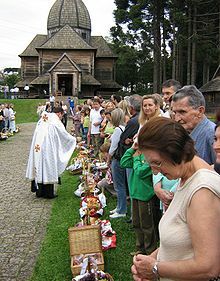 ^ "Slavic community in Curitiba". Brasil.kiev.ua. Archived from the original on 3 December 2013. Retrieved 7 March 2011. ^ Digital edition of Levine's book. Books.google.co.uk. Retrieved 7 March 2011. ^ A research paper about the Jewish immigration to Brazil during the second world war. ^ "Jewish in Curitiba". Heschel.org.il. 18 April 2007. Archived from the original on 17 October 2010. Retrieved 7 March 2011. ^ "Beit Chabad". Chabadcuritiba.com. Retrieved 7 March 2011. ^ Jewish Genealogy site Archived 21 April 2008 at the Wayback Machine lists cemeteries. ^ "Stephen Roth Institute: Antisemitism And Racism". Tau.ac.il. 28 August 2004. Archived from the original on 7 August 2007. Retrieved 7 March 2011. ^ "Japan Square in Curitiba". Curitiba-parana.net. Retrieved 7 March 2011. ^ "Curitiba – Economic ranks". Brasilprimedesign.com. Archived from the original on 8 July 2011. Retrieved 7 March 2011. ^ "GDP – Curitiba". Retrieved 7 March 2011. ^ "A capital do Paraná se destaca na área de TI e oferece oportunidades para profissionais do setor" (in Portuguese). Revista TI. Retrieved 11 October 2003. ^ "Economy – City of Curitiba". Hopebuilding.pbworks.com. Retrieved 7 March 2011. ^ "Housing Program Curitiba". Hopebuilding.pbworks.com. Retrieved 7 March 2011. ^ "Shopping in Curitiba, Brazil". Curitiba.info. Retrieved 7 March 2011. ^ "Instituto Brasileiro de Geografia e Estatística". IBGE. Retrieved 3 January 2013. ^ "Invest in Curitiba - Agência Curitiba S/A". Agencia.curitiba.pr.gov.br. Retrieved 22 March 2017. ^ "Hospital Erasto Gaertner, Historico Institucional". erastogaertner.com.br. Retrieved 26 February 2018. 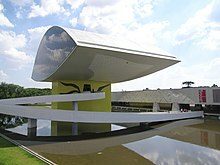 ^ "Curitiba Tourist Attractions and Sightseeing". World Guides. TravelSmart. Retrieved 19 March 2013. ^ "The Wire Opera House: Curitiba's Most Original Theatre". Curitiba in English. 1 November 2010. Retrieved 18 March 2013. ^ a b c "Curitiba Rocks the Brazilian Winter as a World Cup Host City". Gobrazil.about.com. Retrieved 22 March 2017. ^ "Maratona Ecológica de Curitiba – Ladeiras e incentivos do povo curitibano" (in Portuguese). Copacabana Runners. Retrieved 7 August 2008. ^ "Getting Around, Curitiba Travel, Transport and Car Rental". World Guides. TravelSmart. Retrieved 19 March 2013. ^ "Ser Universitário - Tudo sobre o mundo universitário e estudantil!". Seruniversitario.com. Retrieved 22 March 2017. ^ "CURITIBA, UNA CITTÀ DA FANTASCIENZA" (in Italian). Eco Fantascienza. Archived from the original on 1 May 2008. Retrieved 18 October 2008. ^ "Só 1% das cidades está livre de analfabetismo" (in Portuguese). O Estado de S. Paulo. Retrieved 23 June 2007. ^ "Índice da Educação Básica" (in Portuguese). Jornal da Globo. Retrieved 28 April 2007. ^ "Curitiba busca recuperação de biodiversidade local Terra – Ambiente". Noticias.terra.com.br. Retrieved 22 July 2009. ^ "Curitiba – urban plannig". Scielo.br. 31 March 1993. doi:10.1590/S0104-44782001000100007. Retrieved 7 March 2011. ^ クリチバもモデルに＝カブール復興計画に参加 (in Japanese). Nikkey Shimbun. Archived from the original on 3 November 2004. Retrieved 21 October 2008. ^ "RIT Curitiba – Trajetory". Urbs.curitiba.pr.gov.br. Retrieved 7 March 2011. ^ "Social programs in the city". Cmc.pr.gov.br. 16 May 2006. Retrieved 7 March 2011. ^ Anil Mundra (27 December 2012). "Curitiba - Sustainable City". Green Planet Monitor. Retrieved 19 March 2013. ^ "15 Green Cities". Grist. Retrieved 10 July 2007. ^ "Curitiba a green city". 3.iclei.org. Retrieved 22 March 2017. ^ Adler, David (6 May 2016). "Story of cities #37: how radical ideas turned Curitiba into Brazil's 'green capital'". The Guardian. Retrieved 2 August 2017. Up to 8% of Curitiba still lives in favelas; it is not a socio-economic island within the Brazilian context. ^ a b c "9,3% dos curitibanos moram em favelas - Giro pelos Bairros". Giro pelos Bairros (in Portuguese). Gazeta do Povo. 6 September 2012. Retrieved 2 August 2017. Em Curitiba, há 49,7 mil domicílios nesta situação. Isso é equivalente a 163,3 mil pessoas. O crescimento populacional das favelas cresceu 12,4% entre 2000 e 2010, ritmo mais acelerado do que a população como um todo (10,3%). ^ "Curitiba – low pollution". 3.iclei.org. Retrieved 22 March 2017. 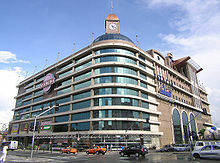 ^ "Palladium Shopping Center". Shoppingpalladium.com.br. Retrieved 7 March 2011. ^ "Teatro Guaíra". Tguaira.pr.gov.br. Retrieved 7 March 2011. ^ "Museums in the city". Curitiba.info. Retrieved 7 March 2011. ^ "Museu Oscar Niemeyer" (in Portuguese). Descubra Curitiba. Retrieved 17 January 2008. ^ "Campanha Sobrevivente - Museu do Holocausto de Curitiba". Museudoholocausto.org.br. Retrieved 22 March 2017. 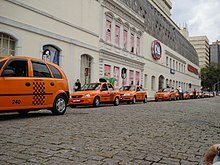 ^ "Festival de Teatro de Curitiba chega a sua 20ª edição com mais de 400 peças - 28/03/2011 - Da Redação". Entretenimento.uol.com.br. Archived from the original on 22 February 2012. Retrieved 3 January 2013. ^ Do G1 PR (9 January 2012). "G1 - Oficina de Música de Curitiba inicia neste domingo com música erudita - notícias em Paraná". G1.globo.com. Retrieved 3 January 2013. ^ "51ª Festa da Uva de Curitiba - Gastronomia - Bonde. O seu portal". Bonde.com.br. 6 January 1990. Retrieved 3 January 2013. ^ "Governador prestigia Imin Matsuri, tradicional festa da colônia japonesa - Paraná-Online - Paranaense como você". Parana-online.com.br. Retrieved 3 January 2013. ^ "Vida e Cidadania". Gazeta do Povo. Retrieved 3 January 2013. ^ "Haru Matsuri comemora chegada da primavera em Curitiba - Paraná-Online - Paranaense como você". Parana-online.com.br. Retrieved 3 January 2013. ^ Tadaima! Curitiba (25 March 2011). "Evento: Hana Matsuri 2011". Tadaima! Curitiba. Retrieved 3 January 2013. ^ Myrelle Silva (15 October 2010). "Eventos: Seto Matsuri dias 06 e 07 de novembro" (in Portuguese). Tadaima - Cultura Japonesa. Retrieved 24 January 2012. ^ "Eventos: 2016 Psycho Carnival" (in Portuguese). February 2016. ^ "Eventos: 2016 Zombie Walk" (in Portuguese). February 2016. ^ "UN Convention on Biodiversity and Biosecurity". Cartamaior.com.br. Retrieved 7 March 2011. ^ Schneider, Keith (23 October 2012). "Putting BRT in Car City, China". Next American City. ^ Goodman, Joseph. "Urban transport of Curitiba". Urbanhabitat.org. Retrieved 7 March 2011. ^ "Curitiba re-launches metro concession tender". 8 July 2014. ^ "Roads in Curitiba". Hagah.com.br. 21 February 2011. Retrieved 7 March 2011. ^ "Rumo". pt.all-logistica.com. Retrieved 12 May 2017. ^ "Curitiba Luxury Train". Serra Verde Express. Archived from the original on 14 April 2016. ^ "Curitiba". Brasilprimedesign.com. Archived from the original on 8 July 2011. Retrieved 7 March 2011. ^ "Curitiba Public Transportation Statistics". Global Public Transit Index by Moovit. Retrieved 19 June 2017. ^ "Curitiba | FIFA World Cup 2014". Curitiba2014.com. Retrieved 22 July 2009. ^ "Arena da Baixada - Curitiba". Aboutcuritiba.com. Archived from the original on 19 August 2014. Retrieved 9 December 2017. ^ Curitiba, Prefeitura de. 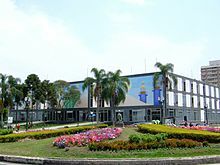 "Centro Cívico - Prefeitura de Curitiba". www.curitiba.pr.gov.br (in Portuguese). Retrieved 25 December 2018. ^ Curitiba, Partiu (26 May 2017). "Conheça a História do Centro Cívico de Curitiba". Partiu Curitiba (in Portuguese). Retrieved 25 December 2018. ^ "Centro Cívico agora é patrimônio estadual". Gazeta do Povo (in Portuguese). Retrieved 25 December 2018. ^ "Curitiba in Brazil Adopts Akureyri as Sister Town". Iceland Review Online. 10 October 2013. Retrieved 10 October 2013. ^ "Acordos de Geminação" (in Portuguese). Câmara Municipal de Coimbra. Archived from the original on 23 January 2008. Retrieved 17 February 2008. ^ "Honorowe Miasta Bliźniacze – Kurytyba (Brazylia)" (in Polish). Krakow.pl. Archived from the original on 21 December 2007. Retrieved 13 January 2006. ^ "Online Directory: Florida, USA". Sister Cities International. Archived from the original on 18 December 2007. Retrieved 17 April 2008. ^ "Acordos de Geminação, de Cooperação e/ou Amizade da Cidade de Lisboa" [Lisbon - Twinning Agreements, Cooperation and Friendship]. Camara Municipal de Lisboa (in Portuguese). Archived from the original on 31 October 2013. Retrieved 23 August 2013. ^ São Paulo Museum of Art. Retrieved in 25/May/2010. ^ Brazilian Academy of Letters: Essay by Eduardo Portela (Portuguese). Retrieved on 25 May 2010. ^ Brazilian Academy of Letters (Portuguese). Retrieved on 25 May 2010. ^ Itaú Cultural Encyclopedia: Viaro, Guido (1897–1971) . Retrieved on 25 May 2010. ^ MOISÉS, Massaud.History of Brazilian Literature: Modernism. 6th Ed. São Paulo: Cultrix, 2001. Retrieved on 27 December 2011.